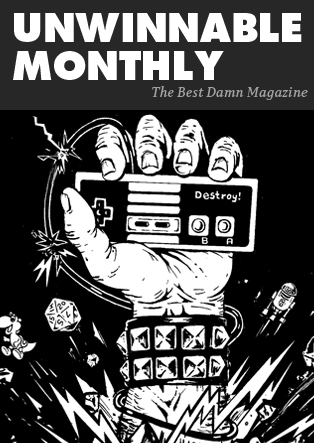 This column is a reprint from Unwinnable Monthly #79. If you like what you see, grab the magazine for less than ten dollars, or subscribe and get all future magazines for half price. You’ve seen everything that happens in Until Dawn a billion times. Even if you aren’t a fan of horror, you know exactly what is going to happen, it is part of our cultural DNA now. A bunch of teenagers alone in a mountain ski resort, in a blizzard, on the anniversary of the murder of two of their friends? There’s going to be bad decisions, underage drinking and lots of improbable, bloody murders. If Until Dawn was a movie, I wouldn’t remember it at all (Like Wrong Turn…that’s the one with the grim reaper killing kids who accidentally survive a car crash, right?). Thing is, Until Dawn is a videogame. Instead of rolling my eyes at the clichés, I had trouble tamping down my anxiety. I played the game in agonizing 20-minute clips, relieved when I turned the PlayStation off and turned up the lights. What gave the tired clichés power again? The answer is simple: my agency. While I have no control over what happens in a horror movie, in Until Dawn, I was culpable. All those characters in a given scene were where they were because of decisions I made, so as that giant spinning blade inched ever closer to Rami Malik’s waist, it drove home the fact that not only could I not save him, but his impending, gruesome end was all my fault. Until Dawn’s success at revivifying horror clichés gives me great hope for the forthcoming Last Summer, by Elastic Games. 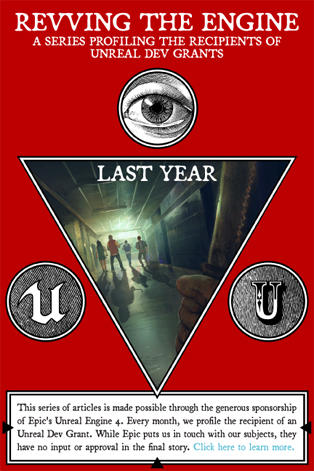 Last Year is an asymmetrical, six player horror game. Five players take on the role of stereotypical high school teenagers. The sixth player is the Killer, watching, stalking and ambushing the kids before they can arm themselves and escape. But it isn’t just like the movies – the kids can band together, improvise weapons and, conceivably, turn the tables on the killer. The four man team – designer and producer James Wearing, lead programmer Charles Goatley, lead artist Alex Halchuk and gameplay programmer Nicholaos Mouzourakis – has rich range of experience in the Montreal game development scene, having worked together on Hitman Go, Hitman Sniper, Lara Croft Go, Far Cry 3 and more. Last Year got initial funding through a 2014 Kickstarter and the Canada Media Fund, before receiving a dev grant from Epic Games. Details on the beta and release dates will be announced soon (follow the game on Facebook to stay in the loop), but in the meantime, James Wearing took time to chat about the project so far, and how the team aims to keep the scares blood-curdling. The first question I have to ask is obvious: What’s your favorite horror movie? One of my favorites is Cabin in the Woods, because it’s such a crazy yet unique spin on the whole genre. This was a point of inspiration for us having multiple types of killers with different abilities. It also got us thinking about those guys in the backroom of the movie, who were masterminding the demise of the visitors. They had control over the environment and decided what happened and when. They made it seem fun. We wanted to take some of that feeling and give the player behind the Killer abilities to experiment and mess with their victims. When somebody falls into your trap, it can be more satisfying than simply killing them. Last Year is obviously an homage to slasher flicks. What attracts you to that sort of horror? We’re inspired by a lot of the late 90s horror and thriller movies, including Scream, The Faculty and I Know What You Did Last Summer. Our goal is to bring players to locations they remember growing up in, such as high school or a suburban neighborhood. As kids, we dreamed of being locked inside a shopping mall overnight, or running wild through the halls of the school while it’s closed. In Last Year, we want to tap into this nostalgia and let you explore these areas while living out your own high school slasher movie. Horror is a genre well known for its clichés and tropes. Have any favorites? Any thoughts on why the persist in the genre? Are they part of the fun? Tropes are an important feature in Last Year. For instance, no matter how far the teenagers try to run, the Killer always manages to catch up and pounce on them. This is a feature we developed called Predator Mode. When playing as the Killer, you’re able to turn yourself invisible, traverse through the environment extremely fast and observe the teenagers at all times. As long as you aren’t within line of sight or too close in proximity to others, you can spawn in and attack. You can also use the environment as your weapon by spawning from within objects such as windows, cracks in the wall, vents and trap doors. 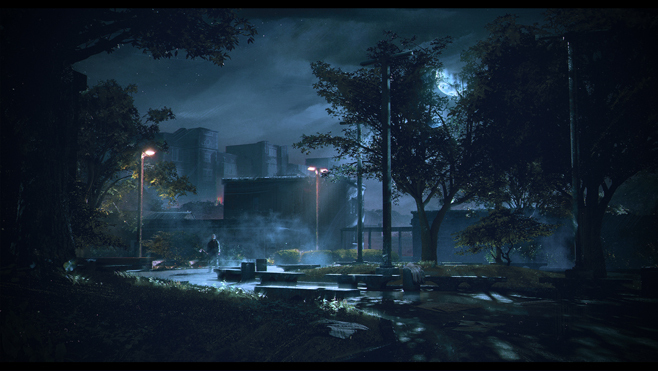 In Last Year, the environment is just as much a threat as the Killers themselves, so players will need to be aware of their surroundings, too. One vs. Many asymmetrical multiplayer is a bit of a new style of game, but it is also the optimal configuration for a slasher-inspired game. What’s awesome about it and what is proving to be a challenge? The most awesome aspect of our game is that the Killer is not overpowered or unstoppable. With the right mix of teamwork, resource gathering and luck, the teenagers can take down the Killer. It’s an extremely rewarding experience. Likewise, as the Killer, you aren’t simply attacking people mindlessly – you need to think, strategize and plan your attacks for just the right time; otherwise you risk facing retaliation. It strikes me that this must be terribly difficult to balance – multiple possible killers against a group that is not only trying to survive, but also collaborate to find the means of escape. Can you describe how an ideal session of Last Year might flow and the challenges you’ve dealt with to get there? In our playtests, the Killer wins approximately 50% of the time. A typical play session starts with the teenagers crafting and searching for supplies within a small confined area. During this warm up phase, the Killer can place traps and rig the environment, but he is not able to spawn. 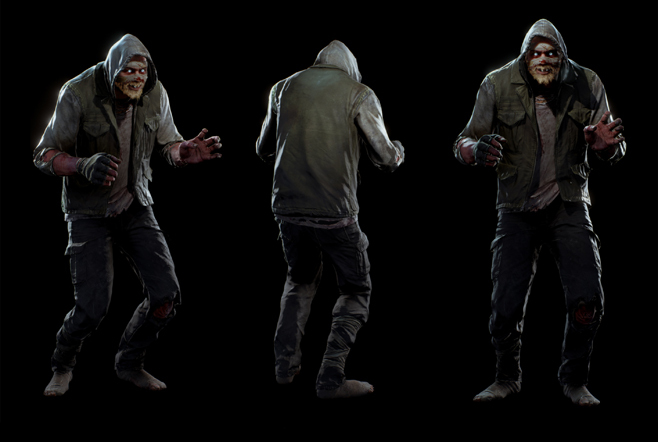 Once the action starts, the Killer is able to spawn and teenagers can either decide to run or try to arm themselves to go head to head with the killer. A great moment that happened during a recent playtests had a group of four teenagers managing to acquire four baseball bats while attempting to rescue a friend trapped in a storage room. As the team went inside to make the rescue, the killer stormed in. Little did he know the teenagers were so well armed. The teenagers shut the door, surrounded him, delivered a 4-on-1 beat-down and killed him. If there is one thing you can expect in Last Year, it’s the unexpected. These kinds of moments happens all the time. If the Killer been more aware of how the teenagers were armed, he might have opted for a different attack strategy. You’ve mentioned that Last Year is built on clichés. Can you tell me about the process of selecting, combining and re-evaluating those clichés? For us this is process comes by way of heavy iteration and testing. We try to bring in clichés that have a meaningful impact on the gameplay and are not there just for aesthetic purposes. When we come up with a mechanic that sounds promising, we discuss it first and try to think of every scenario where it could potentially disrupt or break the game, but we also think about areas it can enhance and work with other features. If a feature sounds promising in the idea stage, we build a rapid prototype, test it with the team and, if it feels rewarding and balanced, it becomes a part of the game. How do the clichés change for the game (as compared to their use in the movies)? In order for clichés to work in conjunction with the other mechanics of the game, they must be features that are dynamic and can happen frequently throughout the game and not tied to one-time only events. This means cliché based mechanics need to be highly re-usable, both from an aesthetic point of view as well as a game balance view, and they do not reference any particular movie scene. In our Predator Mode feature, for example, you don’t always see the Killer, but you know he’s there, he is always watching you and he’s waiting for the right time to strike. This is a core part of the game that is always occurring. On the other hand, if a particular cliché seems like it would only happen once in reality, but happens 20 times in five minutes of play, that feels out of place. We try to limit those moments. I think that people enjoy some horror movies (slashers more so than, say, Cronenberg, who is actively trying to mess with you) because it is a ritual, because they know the rules like in Scream and they know what is coming, and going through the process of that is cathartic in a way. Do you find that to be true of the movies, or your game? Or does the interactivity change it, make the clichés dangerous again? In Last Year we give players the rules but they decide their own fate. In that sense, the interactivity changes it, but it changes it in a way that lets them determine their own outcome. It helps to know what is coming, so in that sense, we try convey this pattern in certain areas of the game, such as knowing when it’s “safe” and when it is not “not safe.” We control the pacing at a high level so that players can understand and expect what the goals are, while the moment-to-moment gameplay (including surprises) is entirely up to the players to decide. They know the theme and what to expect from it, but the outcome and events that unfold are never the same. You ran a successful Kickstarter for Last Year. Did you learn anything surprising about the game, or people’s expectations of it, during the course of the campaign? During the start of the campaign, we tried promoting it everywhere we could, but were met with minimal results and limited traction. Mid-way through the campaign, some images from the campaign game made it on Imgur and it immediately shot to Imgur’s front page. This caused a ripple effect and it appeared on 9gag, Dorkly and a bunch of other sites. Suddenly, the campaign exploded and reached its goal. What surprised us is just how fast things can turn around for your campaign once you connect directly with the fan base. Their support has been incredibly helpful during development and we couldn’t have gotten this far without them. How is UE4 for developing this sort of game? Does it pose or solve any particular design challenges? In Last Year, we wanted the gameplay to feel exciting and unique so we ended up using things like Blueprint to help us achieve this. We feel it’s important to play what you intend to make as soon as possible in order figure out what works and what doesn’t. Blueprint ended up being a time saver for a variety of things, even for our most experienced programmers. As soon as we found a gameplay mechanic that was fun, it was much easier to take it and fold it into C++ code and events which we could use elsewhere. A lot of the tools for the artists just work very well out of the box and it’s allowed us to make a lot of progress in creating the kind of atmosphere you’d expect in a horror game. We had some good looking levels, but with a few lighting adjustments, post processing and some particles it takes on a whole other appearance. It’s allowed us to be creative with the look of our locations and achieve that scary film quality that our fans are looking for. How did the Unreal Dev Grant come about? How did it change things? What has it allowed you to do? We applied and showed Epic some of the content we had been working on. We were really glad they saw the same potential and interest in the game and we were lucky enough to receive a grant. It’s been extremely helpful in helping keep the lights on and pay for costs such as rent, equipment, and other expenses. We honestly can’t thank Epic enough or the support they’ve given us.